The Cashpower Three Phase meter is a four-wire 100 Amp per phase, keypad-based prepayment meter in a compact BS housing. The meter is suitable for residential, commercial and light industrial environments. An optional local keypad and display can be fitted to the meter at the time of manufacture. The meter also features a dedicated diagnostic indicator which shows the status of communication to the remote customer interface unit. The meter boasts a large custom display and also features a host of standard Cashpower software features including the ability to operate as a prepayment meter or in credit metering mode. The Landis+Gyr Keypad Prepayment 3 Phase (wired) meter is mechanically sealed against tampering through the use of factory sealed plugs and optional sealing wires for the electronic enclosure. In addition the terminal cover can be sealed by standard utility seals. 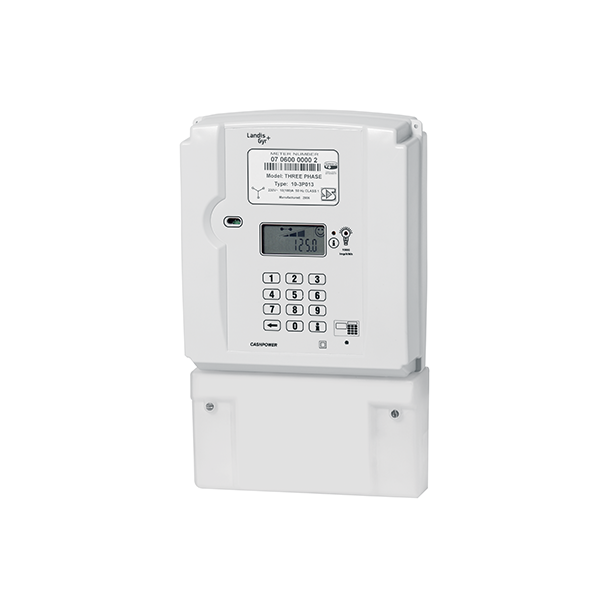 The Landis+Gyr Keypad Prepayment 3 Phase (wired) meter is equipped with a tamper sensor that will automatically disconnect the power to the load in the event of tampering. The meter is usually installed outside the home in a secure, locked enclosure which should not be accessible to the consumer. This facilitates easy inspection by the utility at any time and reduces the opportunity of fraud by tampering.